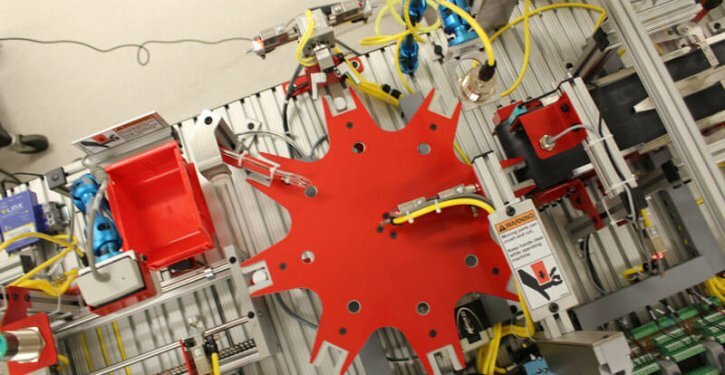 The Advanced Manufacturing Technology Center at Asnuntuck Community College offers students the opportunity to participate in a company-sponsored Scholarship Program based on availability. The purpose of the scholarship is to give greater access to recent high school graduates and young adults who possess the basic qualifications for a successful career in manufacturing. A company representative will meet with students who achieve the essential criteria for acceptance. Then, a tour and an interview will follow before the company decides whether to sponsor a student for the one-year program in technology development. The scholarship includes tuition, fees, and books. The sponsoring company will monitor the progress of the students for grades, attendance, attitude, productivity, and ability. Upon receiving positive feedback from the company supervisor regarding these criteria, the sponsoring company will pay the 2nd semester tuition; the sponsoring company also agrees to a paid internship weekly during the second semester. At the conclusion of the program, the student may have the opportunity to seek employment with the sponsoring scholarship company.